One of the most important records of the Earth’s CO2 concentrations is 30 miles away from a carbon dioxide-spewing volcano. Scientists adjust for the fact that Mauna Loa is a volcano to make sure their measurements are accurate. 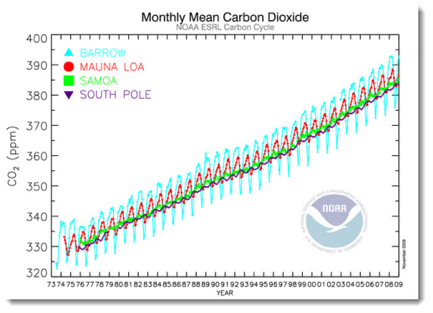 Continuous measurements taken at the Mauna Loa Observatory clearly show that carbon dioxide has been increasing in the atmosphere since 1958. And Mauna Loa isn’t the only place this pattern is seen; data from observatories in Alaska, American Samoa and Antarctica all show the same upward trend. Scientists were well aware when they selected Mauna Loa that it’s a volcano. But they also knew that most of the time, the wind blows volcanic gases (including carbon dioxide) away from the observatory. When the wind infrequently shifts, there’s an obvious spike in carbon dioxide. Measurements from the “volcano days” are removed from the Mauna Loa dataset. That's how scientists make sure the data are accurate. The observatory near the summit of the Mauna Loa volcano in Hawaii has been recording the amount of carbon dioxide in the air since 1958. This is the longest continuous record of direct measurements of CO2 and it shows a steadily increasing trend from year to year, combined with a saw-tooth effect that is caused by changes in the rate of plant growth through the seasons. This curve is commonly known as the Keeling Curve, named after Charles Keeling, the American scientist who started the project. Early attempts to measure CO2 in the U.S. and Scandinavia found that the readings varied a lot due to the influence of growing plants and the exhaust from motors. Mauna Loa is ideal because it is so remote from big population centers. Also, on tropical islands at night, the prevailing winds blow from the land out to sea, which in effect brings clean, well-mixed Central Pacific air from high in the atmosphere to the observatory. This removes any interference coming from the vegetation lower down on the island. But how about gas from the volcano? It is true that volcanoes blow out CO2 from time to time and that this can interfere with the readings. Most of the time, though, the prevailing winds blow the volcanic gases away from the observatory. But when the winds do sometimes blow from active vents toward the observatory, the influence from the volcano is obvious on the normally consistent records and any dubious readings can be easily spotted and edited out (PDF). Importantly, Mauna Loa is not the only atmospheric measuring station in the world. As the graph from NOAA shows, other stations show the same year-after-year increasing trend. The seasonal saw-tooth varies from place to place, of course, but the background trend remains steadily upward. The Keeling Curve is one of the best-defined results in climatology and there really are no valid scientific reasons for doubting it.